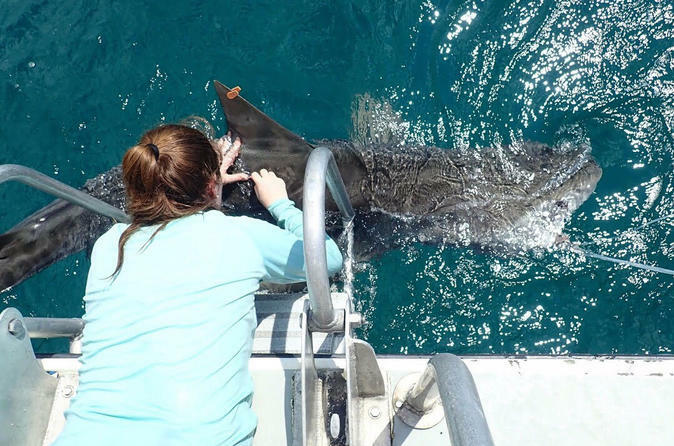 The Shark Research Experience will provide you the opportunity to participate in shark research conducted by Florida International University shark research program off the coast of Miami. Guests will have the opportunity to learn about and assist with research conducted as part of a fun and rewarding experience in a beautiful environment. The experience will enhance understanding of the role of sharks in the ocean ecosystem and the efforts needed to preserve the species. Meet at Miami Beach Marina at 8:15 am to check in. Tour will depart at 8:30 am. You will enjoy a boat ride to the reef with a Shark Researcher who will teach you about the work FIU is doing to protect these incredible creatures. When at the reef, we will bait and set the lines in various locations. The crew will carefully bring the sharks alongside the research boat where our Researcher will tag, take tissue and blood samples and measurements of the sharks. Guests will have the opportunity to learn about and assist with research conducted as part of a fun and rewarding experience in a beautiful environment. The experience will enhance your understanding of the role of sharks in the ocean ecosystem and participate personally in the efforts needed to preserve this incredible species essential to the ecosystems of the world's oceans Researcher will tag, take samples and measurements of the sharks. We will return to the marina by 12:30 pm.